NEW ORLEANS – While there were some changes across the rankings from the preseason poll, every No. 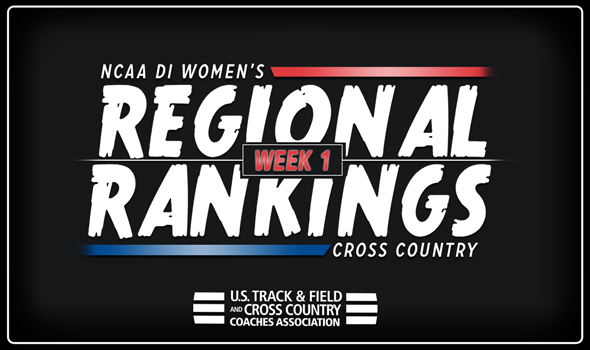 1 team remained the same in Week One of the U.S. Track & Field and Cross Country Coaches Association (USTFCCCA) NCAA Division I Women’s Regional Rankings that were released on Monday. The cross country season is starting to pick up as teams across the country continue to shake off any remaining rust and start to get prepared for the heart of their schedules. See below for more information on the rankings, including overviews of each region as well as the full top-15 lists of each region at the bottom of the post. The top-two teams in each region automatically advance to the NCAA Division I Cross Country Championships. The NCAA Division I Regional Championships will be held around the country on November 9 while the NCAA National Championships will take place Saturday, November 17 in Madison, Wisconsin. USTFCCCA Regional Cross Country Rankings are determined subjectively by a single member coach in each respective region. The regional representative is tasked with weighing returning teams strength with current season results (if applicable) in determining predicted team finishes at the NCAA Regional Championships. There was no change in the top-five of the Great Lakes region as many of the top teams have yet to run this season. No. 1 Wisconsin is still waiting to get its season underway. The Badgers open with the Badger Open on September 14 which will serve as their first preview of the Zimmer Championship Course which hosts NCAAs in November. No. 2 Michigan got its season started with a win in the Michigan Open and will look to keep the momentum going at the Greeno/Dirksen Invitational in Lincoln, Nebraska on Saturday, September 15. The meet will preview the site of the Big Ten Championships for Michigan. No. 3 Michigan State, No. 4 Indiana and No. 5 Notre Dame all stay in their same placements from the preseason poll. Each team has had early season success with the Spartans winning the Jeff Drenth Memorial, the Hooisers taking the title at the Miami Opener and the Fighting Irish picking up a win at the Crusader Open. All three teams have yet to run their full squads. No. 1 Penn State remained atop the region after an impressive win at the Spiked Shoe Invitational that included top-ranked teams from the Northeast Region in Syracuse and Cornell in the field. It was the second-straight victory for the Nittany Lions after the group opened its season with a win at the Lock Haven Dolan Duals. The No. 2 spot remained with Villanova who still has yet to run this season. The Wildcat will get the year started with the Main Line Invitational on Friday, September 15. The top-five was rounded out by No. 3 Georgetown, No. 4 Penn and No. 5 Princeton. The Hoyas kept the third position with a third-place showing at the Spiked Shoe Invite. Penn jumped up from No. 7 to No. 4 after winning the Bison Open while Princeton dropped one from the preseason poll to the fifth position. No. 1 Iowa State remained atop the region after picking up a victory in the University of Iowa’s Hawkeye Invitational on August 31. Slotting it at No. 2 is Minnesota who also won its opening meet with a perfect showing at the Oz Memorial. No. 3 Oklahoma State, No. 4 South Dakota and No. 5 Northwest make up the region’s top-five. Oklahoma State and Minnesota traded placed from the preseason poll while Northwestern improved two spots to move up to fifth, knocking Bradley out of the top-five. There was no change to the top teams in the Mountain Region as No. 1 New Mexico keeps the top spot after placing second to open the year at the Lobo Invitational. The defending NCAA National Champions did not run their full squad at the meet. No. 2 belongs to Colorado who won the Wyoming Invite and showed what could be some great depth for the back end of their scoring roster early this season. No. 3 Utah State, No. 4 BYU and No. 5 Colorado State all remained in the region’s top-five. Utah State won its home meet while Colorado State placed third at the Wyoming Invite. BYU still has yet to run and will open its year with the BYU Autumn Classic on Saturday, September 15. There was little change in the Northeast Region as Providence remained in the No. 1 spot after collecting a victory at the UNH Dual Meet. Syracuse took the No. 2 spot after an impressive second-place showing at the Spiked Shoe Invitational, besting teams from Georgetown, Cornell and West Virginia in the process. No. 3 stayed with Dartmouth after they collected a win at their home opening meet, the Southern Invite. Cornell and Yale flip-flopped position from the preseason rankings with Cornell coming in at No. 4 while Yale took the No. 5 spot. Like other regions, there was no change to the top teams in the Southeast either. NC State remained in the No. 1 spot as the Wolfpack still have yet to open their campaign. NC State takes to the course for its first action with the Adidas XC Challenge on Friday, September 14. Furman stayed in No. 2 after it won its third-straight Eye Opener Invitational. No. 3 Virginia Tech, No. 4 Duke and No. 5 Wake Forest stayed in its positions to make up the region’s top-five. There was some slight movement across the top in the South Region, even if the top units remained in their spots. No. 1 Georgia and No. 2 Florida State kept their positions as the top teams in the region. The Bulldogs took second at the Bulldog Invitational without running its top squad while the Seminoles picked up a victory at the Covered Bridge Open. The top-five saw its changes in Georgia Tech moving up one to the No. 3 spot after the Yellow Jacks won the Bulldog Invitational with a slight upset over Georgia who wasn’t running its full team. Mississippi State dropped one spot to No. 4 while Tennessee entered the top-five for the first time this season at No. 5. The No. 1 ranking in the region still belongs to Arkansas after the Razorbacks took third overall at the Hurricane Invitational. Texas slots in at No. 2 after the Longhorns have collect two consecutive wins to open the season at the Texas and Rice Invitationals. No. 3 belongs to SMU after the Mustangs won the team title at the Baylor Twilight Invitational. Baylor comes in at No. 4 after placing second overall at the Baylor Twilight. Jumping into the top-five is TCU who improved one spot to No. 5 after a third-place showing at the Baylor Twilight. There were no change at all to the top teams in the West Region. No. 1 is still Stanford who collected a win at the USF Invite to open the year. Slotted in at No. 2 is Oregon who took second at the Oregon Preview despite not running its top lineup. The top-five is rounded out by No. 3 Boise State, No. 4 Washington and No. 5 California. Boise State has been impressive to start the year with an opening victory at the Sundodger Invitational. Washington took third at the Sundodger while Cal finished in third at the USF Invitational.